I just miscounted how many GPIO pins I had for a project, so I had to find a way to save some pins. In this project we have a status LED that is either red, green or both (producing a somewhat orange color). I need 4 of these per Photon, so that's 8 pins. What about using programmable ws2812, sw2812b or SK6812 LED's? They only need a single pin to drive many LEDs (NeoPixels is just the marketing name that Adafruit apply for all of these), so I can potentially save up to 7 pins, but also make other colors than red/green possible. Surely enough, I had some of these floating around from a former project. For my Bitmart marquee sign I used maybe 90 of these, but I kept having bugs causing random flashes if I pulled too much power. Back then I used a 74HCT125 for level shifting, but I couldn't find either that or the 74AHCT125 variant in my component shelves. I did however find some 74HCT245 deep down in a drawer and surely enough - these are what is perferred for driving these programmable LED's in the Teensy community. Both will do the job! I plugged it up and it worked perfectly! No glitches, just perfect timing. From the datasheets, the 74HCT125 and 74HCT245 looks to have very similar characteristics, but the first shifts 4 lines and the other shifts up to eight lines. The one I used in the Bitmart-sign was just one I found in a shelf at Bitraf. Maybe that one was damaged? Hmmm. I'll have to revisit that project to fix the glitches, but for now I've solved my problem. I had a hard time locating pinouts / connection schematics for these IC's so here they are for use with Particle Photon. Yellow wire is data out from the Photon. Purple is the level shifted data signal. Red is 5V. Black is GND. Do not omit the fat Capacitor that feeds the fast PWM LEDs. By itself, the module can't do much, so you'll need a microcontroller of some sort. My preference is using a Teensy 3.1 since these are just incredibly flexible, fast & cheap. They're also small and placement friendly. By now I've used the FONA for two commercial projects and I thought it'd be nice to collect my experiences in this post. The first project had me build the FONA into an advertising board. Check this video to see it in action. The large timer was connected to a motor that pulled it slowly back to zero. At each end position of the timer, there was a manual switch that triggered the FONA in different ways. When the timer was set to 15 minutes, the Teensy set the FONA to call up the pizza delivery. If the person turning the timer wanted, they could get a free pizza within 15 minutes. When the timer was set back to Zero, the Teensy prepared the FONA for the next customer. As can be seen in the video, it was a snowy morning and I got to do some extra troubleshooting in the bus shed since the timer motor accidentally burned out the evening before and the replacement motor made so much electrical noise that it messed up the sensing on the button pins. I solved this by moving the button pins to analog pins and using a different threshold than the normal digital I/O used. The FONA used a normal headset-mic to pick up the sound. To play it back I used some more Adafruit components - a 3.7W amplifier and these neat transducers. Despite being only 5W, it was not a problem to hear the sound on a busy Bus-stop when attaching the transducer firmly to the board itself. While the person waited for their pizza, we also played them some cheezy elevator-music. This came from the Teensy using the Audio Adaptor board. I really dig this board. So many cool audio things you can do. Really powerful! The installation stood there for a whole day and worked without any issues despite the moist weather. Call anywhere in the world for free! 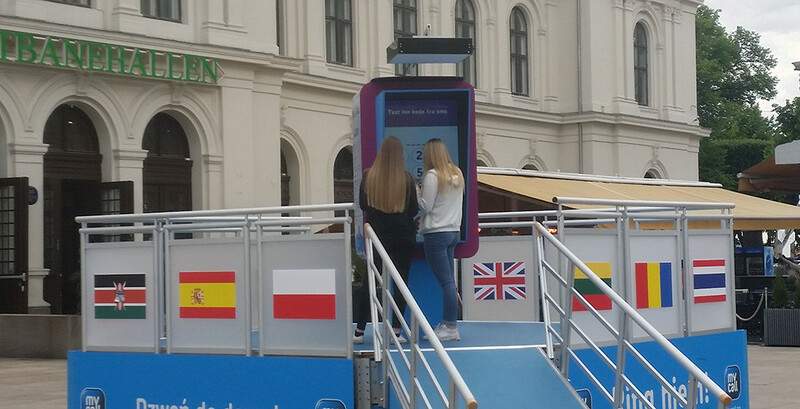 The second project had us set up a telephone booth that looked kind of like a 1.2 meter tall iPhone. 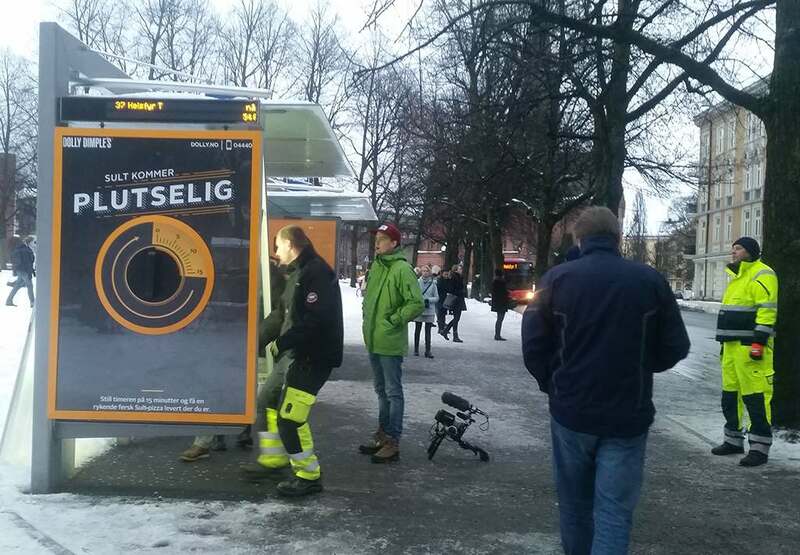 It was to promote the mobile provider MyCall and the idea was to make a phone booth where you can call for free (3 minutes at a time). JCDecaux also made a nice video for this one that highlights that the campaign gave 30% boost in sales. The interface to the user was a 47" touchscreen showing a multi-screen AIR app that communicated with a Teensy 3.1 via Serial. Before calling, the user was asked to input their existing phone number. After their free call was finished, we used their phone number to send them a polite SMS telling that MyCall offered great prices on calls abroad (their specialty). The project stood outside in a very public space (outside the Oslo central station) for 10 days and worked without a single error. I'm really happy with the stability of the FONA/Teensy combination! Both projects were done for JCDecaux with MesseTjeneste making the enclosures and me doing the software + electronics. The FONA needs a battery to be able to source the required power upon connecting to the network. 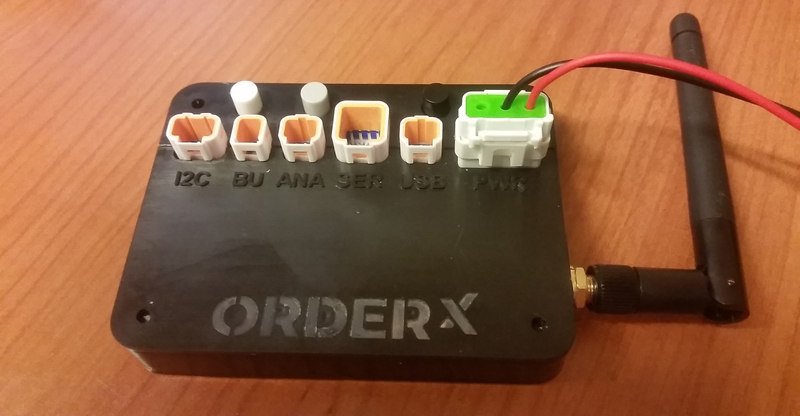 A 2.2A / 5V dedicated power supply was not enough, but a half-charged 150mA lipo in addition to the USB connection did the trick. The lipo battery is now added as a requirement on the FONA product page. Once a call was placed or the FONA connected to the network, the audio chip in the Teensy Audio board was completely messed up. It produced random and unpleasant audible noise. I solved by moving the FONA away from the Teensy, putting them in two separate boxes. I also tried shielding them from each other, but I got very varying results. Much easier to just move them away from each other. I initially picked up a dirt cheap SIM card at a kiosk and it worked right away. This was from MyCall, the company I later made the kiosk for. I then needed to make a copy of the installation, but when I tried to use a SIM card from Norway's largest telco Telenor, it didn't work. The SIM worked like a charm when inserted into a phone, but on the FONA I was unable to connect to the network. The SIM unlocked successfully, but I was denied access to the network. I later learned that holding down the KEY button for 20 seconds can solve this. I needed to blink some lights while a call was in progress and play some audio when the call ended. There currently isn't a method in the default library to check this, but all I had to do was to look up the SIM800L datasheet to find the required AT command. I then looked through the Adafruit code to see how they had implemented similar features and added this (gist). It's all just serial AT-commands that are wrapped nicely. Super simple! Since the Teensy has several Serial ports, you may need to make some minor changes to the default FONA sketches and lib. I've detailed these in this gist. Imagine an interactive window display controlled via SMS? Using it as a transparent network access point? Circuits that allow you to check status or remote control vending machines or controls? It would be really simple to make a machine send an SMS if it fails to do it's task, so it can alert you that it needs service. It's so many cool things you can do with this when you don't need to think about having wifi available! I really dig how easy it is to build connected installations with the FONA board and it looks like others also think so since Adafruit has now expanded the range to also include a board with a GPS and some convenient starter packs. I'm looking forward to play much more with FONA in the future! Please note: this article is 3 years old. Since then a lot has happened to the ESP's. They're more stable since version 1.1x and they are now super easy to integrate with the Arduino IDE. Like many others in the Maker Community I've spent a lot of time playing with the dirt cheap ESP8266 wifi chip. It is the cheapest way to add wifi to your project and it's easy to get hold of. My hope was that it would be solid enough that I could build permanent installations and fun Internet Of Things (IoT) devices with it, but the darn thing keeps crashing. I've been testing it since the 0.91 firmware and all the way up to the current 1.0 version and it's not possible to keep the device running for a prolonged period of time. I've spent more than a weeks worth of time getting it to not crash at random intervals, so I thought I'd share what I've learned in case others find it useful. The best way to hook up these dev boards is to use the ESPlorer software (java) and getting a USB to Serial converter. If you have a version that offers 3.3V on both data and power lines (such as this one), it is the most convenient. If you can't find a 5V USB to Serial, you should know that the Serial pins (RX/TX) are supposedly 5V tolerant, but the power must be 3.3V or you will fry the chip. The ESP modules will pull a couple hundred mA, so powering it from a good 3.3V power source such as a LM1117 / LD33 can be a good idea. There's many guides to hooking up the various development boards, so I won't detail that part, but lets look at the software side of things! When you buy the ESP-01 breakout boards from ebay, you never know what version of the firmware it comes with. Most likely it will be an old one so you'll probably want to update it. But - what firmware should you use? NodeMCU is a firmware that adds a LUA layer on top of the (somewhat stable) official 0.95 Espressif SDK. This seems to be the most stable firmware you can currently use and it is also the one that is the easiest to get started with. It is well documented and offers good tools. Rui Santos has a great guide for hooking up an ESP-01, burn the NodeMCU firmware and setting it up as a webserver. Briefly said, you hook up the ESP directly to a USB to Serial converter (3.3V! ), download the NodeMCU Flasher tool, select the COM port and hit the Flash Button. The NodeMCU firmware is based on the original Espressif SDK and thus inherits all the bugs it comes with. This means that the hardware will crash just as often, but since it always restarts after a crash, it will re-run your LUA script on startup. This makes NodeMCU good enough for devices that will just send some sensor data to a webservice such as Thingspeak. It will not work as an access point doubling as a webserver though. It'll crash and hang just as often as with the original firmware, so for me this is a showstopper. 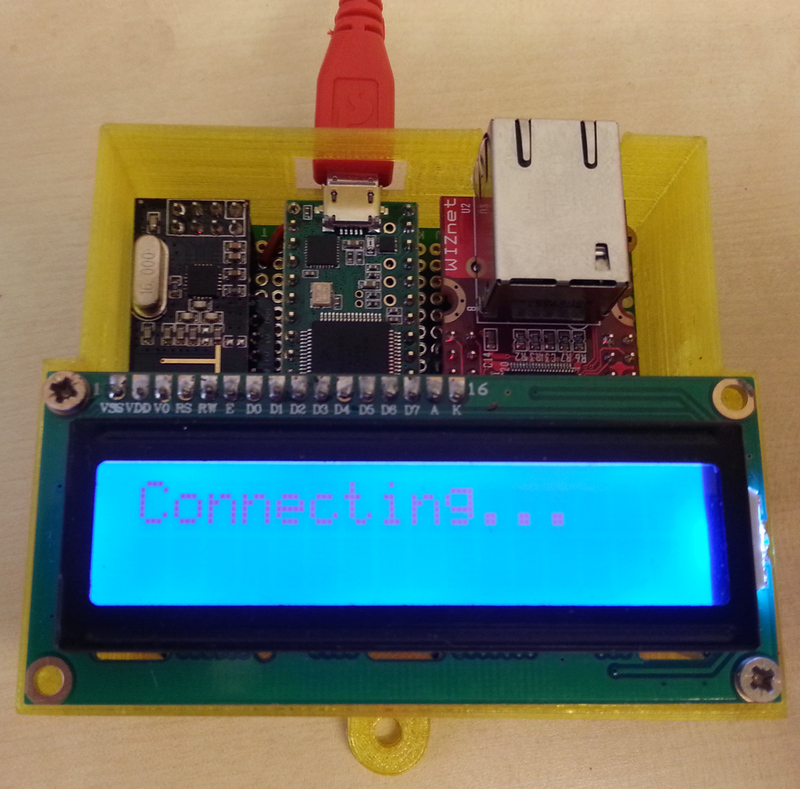 I want to make IoT gadgets that serve up a web interface as well as an open API. Updating the firmware is quite easy if you use the NodeMCU Flasher. This has a nice, minimal GUI and everything is point and click. It's Windows only though, so if you like Python, check out the esptool. All the officially Espressif SDK's contain a "bin"-folder that has the precompiled files and a text description of what memory addresses to copy each .bin file into. That pretty much rules out using the official firmwares. How about making your own then? Espressif provides an SDK and the required code to compile your own version. Building it yourself is quite easy if you have a Ubuntu VM. Just follow the instructions outlined here. This will however not solve all your problems. Some of the codebase is Open Source, but other parts are provided as "binary blobs" so you can't really know what bugs are hiding inside. You can however exclude those parts of the Espressif SDK that you suspect to be causing the problems, so if want to program the ESP8266 directly check this neat guide on Hackaday. This "Transparent Bridge" is the solution I'm currently experimenting with. It's a completely dumbed down firmware that can take a TCP connection on any port and relay it to the Serial port (RX/TX). Just apply power, connect to the WiFi access point that it sets up, Telnet to the default 192.168.4.1 address and you can set it up to join your local network / access point. You can then up the BAUD rate to whatever you want/need and change the Port to for example 80 to make it work easily with browsers. I'll post back here when I have more details & results on this setup. But why care if it's buggy? You might ask yourself - why on earth should one care about this chip if it is so buggy the creator has to host a competition to find all the bugs? The thing is - at $2 you can put wifi into ANYTHING! A typical wifi-shield for an Arduino will cost you from $30 and up to $90. Just a plain breakout board from Adafruit will cost you $35 and the CC3000 that it's based on isn't exactly stable either. A $2 chip that works would open up so many possibilities, so that's why I still care after fiddling this much with it. I presume that you already know a bit about the hardware if you're reading this. If not, here's some details. The ESP8266 is a small powerhouse and this is a small 101 on the hardware. It's an ARM processor that runs at 80Mhz and can be overclocked to the double. 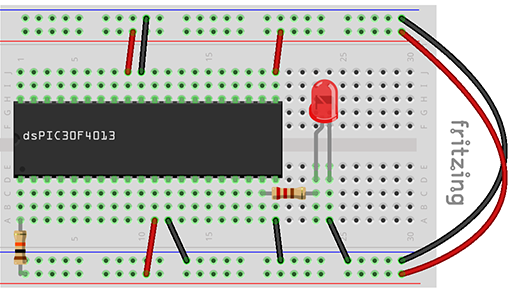 It has up to 16 GPIO pins available and it does SPI, I2C, UART & more in hardware (fast!). It offers great range and you can get one for as low as $2 on ebay. Physically, it is a tiny 5 x 5 mm Integrated Circuit that needs a little supportive components around it to be useful. There is a series of dev-boards that offers this: ESP-1, ESP-2, ESP-3, ESP-4, ESP-5, ESP-6, ESP-7 and so on, all the way up to ESP-12. They differ with regards to pin spacing, internal/external antenna and the number of GPIO pins broken out. It was hard to locate all the pinout diagrams, so I've gathered them all in a github repository that I'll fill with useful code and resources. The original datasheets has some decent info, but check the ESP8266 wiki for more details. The ESP-1 is typically the cheapest and most available. It only has 2 I/O pins broken out and uses 2.54mm headers. They are however clumsily combined into a 2x4 arrangement making them impossible to breadboard. It's not hard to make an adapter, but the ESP-2 is more practical for breadboard use. This also has a third I/O pin broken out, but requires an external antenna. The different versions all offer useful features, but the ones to avoid are ESP-5 and ESP-10. These do not have the pins required for updating the firmware exposed. The version that seems to attract the community is ESP-12. It has FCC certification, RF-shielding, ADC and 9 GPIO's. It is included in the NodeMCU devkit that you can now get from TronixLabs and several other Open Hardware vendors. I'm looking forward to getting a couple of these to play around with. Other devboards that look interesting are the new one's from Olimex. In the store they needed a way to show information from the finn.no website and this was the job I couldn't say no to. Apparently it isn't very easy to get hold of a wifi-enabled LED display that can pull data from the web? 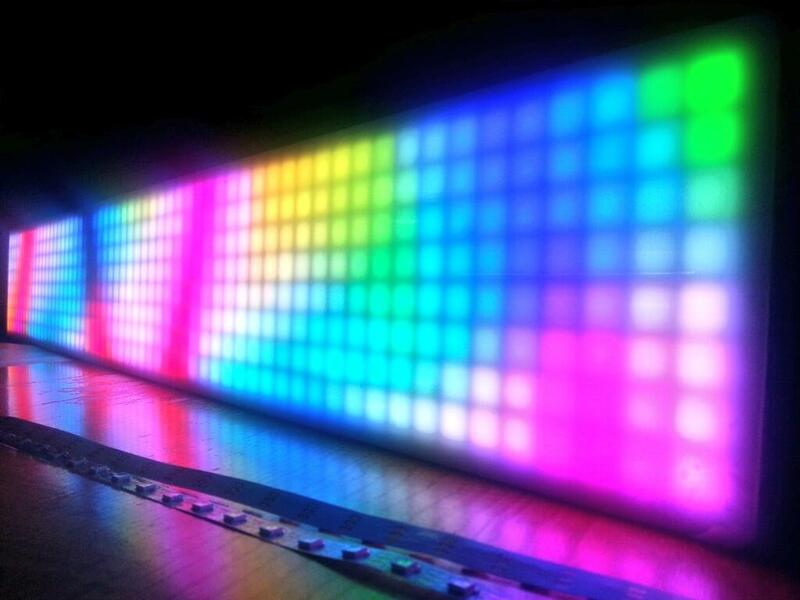 Also - most commercially available displays are small, monochrome and use tiny LEDs so they're not that visible when mounted high up on a wall. The agency wanted 5 large displays, perferably with more than one color display. Having recently read about Teensy 3.1 and the OctoWS library I promptly said I'd do it! 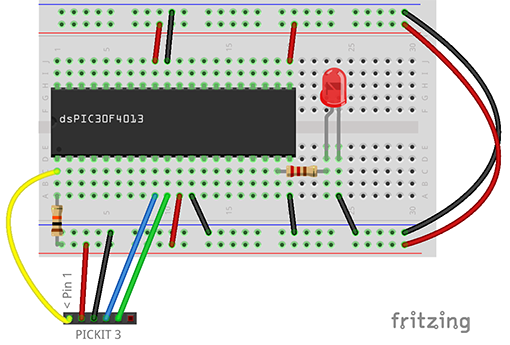 The Teensy microcontroller is a great alternative to using Arduino's in installations. It has a really fast ARM processor and lots of RAM, but it is still 99% Arduino compatible. This means that pretty much all Arduino code will run on it, but at blazing speeds. After installing a little extra software, you can use the normal Arduino IDE to program it, so it's really an "Arduino compatible". It's so compatible (and affordable @ $20!) that I feel that this is really the path that the Arduino Team should have taken instead of making bigger and more complex boards. 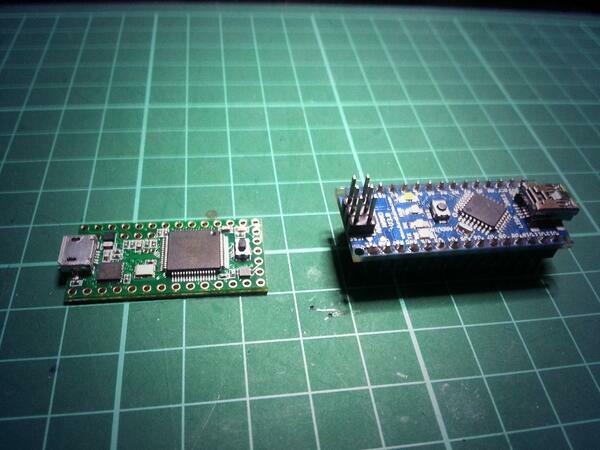 Here's how the Teensy 3.1 looks next to an Arduino Nano. It's soo tiny that the Nano looks big! For the parts, I could have saved some money by picking it up from different places, but I didn't have much time. I picked up tons of Neopixels & Teensy's from Adafruit since they'd ship the parts so I had them within a week. Buying parts from Adafruit really makes a difference since the whole process is completely trouble free. It's a little more expensive, but worth every dollar. Lovely, isn't it? You can see the neopixel strips lying in front. I stuck these to the back plate using the same clear silicone that I used to fix the panel to the front. The first test showed that we'd have to compensate a little for every 50cm as the neopixels are put together of 50cm segments and loose a few mm in the overlap between these. When using MDF as material, make sure each protuding part has a certain minimum size or they'll break off easily. Research carefully what kinds of silicone that will remain fully transparent over time. Most clear silicones will get a yellowish tone over time. The ones that are made for aquariums appear to be the most suited ones. When exposed to heat for a long time, MDF will want to "bend". Make sure you stick it down properly to avoid too much maintenance. Soldering and gluing together the displays took quite some time, but it was made a lot easier by Paul Stoffergren releasing these neat adapter boards. I added a 2.4Ghz radio to each of these and tucked it away on the back of each display. Here's a photo showing 1920 pixels running at once. Note that the Mac to the left is on full brightness! The displays are so bright that they're visible in daylight as well. Each sign requires quite a bit of cable and with the amount of current going through them, this was the first electronics project I've made where I've had to calculate the correct diameter of each cable. A good learning experience! I could have built a Wifi adapter inside each of the displays and in hindsight, that would have been an easier choice if it wasn't for wifi issues. What I went for instead was a server-client solution where a single box would connect to the internet as well as serve up a webserver that could be used to control all the 5 signs. It has a Teensy 3.1 that holds a custom webserver, uses cable for internet access, has a display that shows status and the IP address of the webserver as well as a nrf24l01 radio (2.4Ghz) that sends data to the signs. This is put together in a nice 3D printed box that is wall mounted. 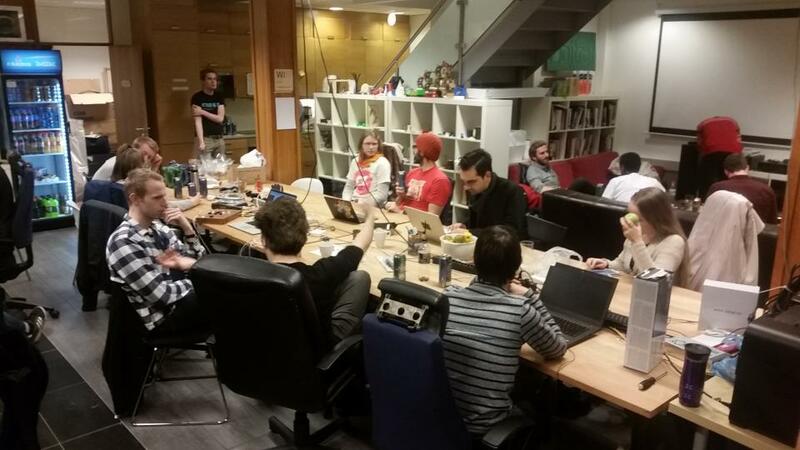 The Ethernet library for Arduino is a synchronous API. When the device fetches data from the internet, it'll freeze a short while until the data is received. None of those issues are big problems, but they're worth noting if you are building something similar. Initially I planned to use a Raspberry Pi to be the webserver, but it turned out to be really hard to make the NRF24 radios work reliably with GPIO on the Pi. I've since noticed that the NRF24 dislikes fast CPUs, so if you're trying to make this readio work on the Pi, make sure to add a delay to your main loop. The Teensy 3.1 is also too fast for this radio. The final result is that you can use any device such as your phone to control what is displayed on each of the signs. I've also built some remote admin to it as well. Every time the displays power up they'll await instructions from the server. The server fetches API data such as how many tractors are for sale or what are the latest boats available, and sends this to the displays. It's super flexible and a true IOT solution. Disregarding some (serious) mounting issues beyond my control, I really loved solving this project and you can check it out if you're in Oslo. After making this, my wife said that I should start making and selling these commercially. 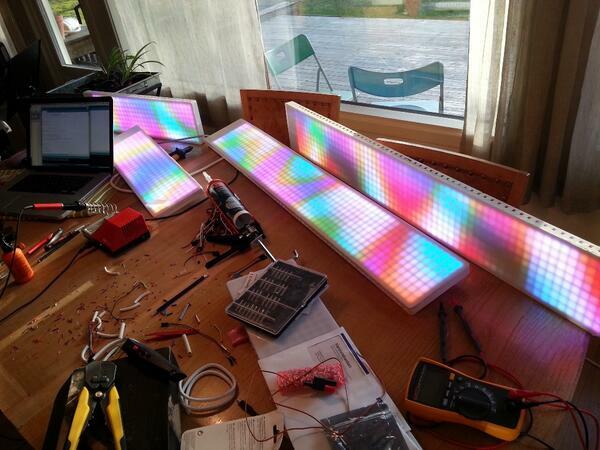 It's probably a good idea, but I really can't see myself selling LED signage. However - if you have some weird project in the Internet of Things domain - feel free to contact me. I love a good challenge!